Chinese Space Lab Crashes To Earth : The Two-Way Tiangong-1, an abandoned Chinese orbiting lab, re-entered the atmosphere over the South Pacific Ocean Sunday evening, fulfilling predictions by the European Space Agency. Visitors sit beside a model of China's Tiangong-1 space station in 2010, at the 8th China International Aviation and Aerospace Exhibition in Zhuhai in southern China's Guangdong Province. As forecast, China's defunct Tiangong 1 space station re-entered Earth's atmosphere Sunday. As predicted, China's Tiangong-1 space lab fell from the sky on Sunday evening. The city bus-sized craft, which almost entirely burned up as it re-entered the Earth's atmosphere, broke into small pieces as it plummeted over the South Pacific Ocean. The derelict spacecraft has been slowly falling out of its original orbit for several years. The disintegrating lab hurtled from orbit toward the South Pacific waters at about 8:16 p.m. ET, Space.com reports. Scientists say the disintegrated debris that survived the fiery descent was likely small and relatively harmless, reports NPR's Rebecca Hersher. "The Chinese space agency had originally planned to bring the lab back in a more controlled way," Rebecca says. "But after it stopped functioning in 2016, they decided to let it fall to earth on its own." As NPR's Scott Neuman noted in our earlier reporting, the "space lab" was part of China's planned research as it works toward a permanently staffed space station. (China does not participate in the operation of the International Space Station.) A second space lab, Tiangong-2, was launched in 2016. "The 34-foot-long, 18,000 pound Tiangong-1, or 'Heavenly Palace-1' was launched in 2011 as China's first attempt at an orbiting space lab," Scott wrote. "It was occupied by two separate crews of three astronauts, or taikonauts, each – a mission in June 2012 included China's first female astronaut, Liu Yang. A year later, another crew included the country's second woman in space, Wang Yaping." The demise of Tiangong-1 has been long anticipated. In 2016, an amateur satellite tracker observed that the satellite appeared to be on track for an uncontrolled fall of orbit. 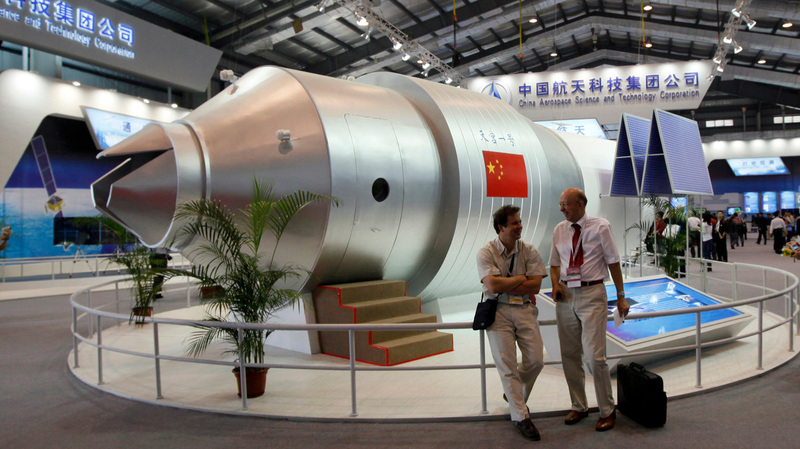 That was months before the Chinese government acknowledged that the space lab would be re-entering the earth. At the time, China had predicted a late 2017 re-entry, but later estimates pushed that date back into early 2018. The "re-entry prediction window" from the European Space Agency, or ESA, had tightened significantly by Sunday morning, to a four-hour window centered on 1 a.m. UTC on Monday. In the continental U.S., that's Sunday evening. ESA previously projected the craft to fall between a vast swath of the planet, including the entirety of Africa, most of South America, the continental U.S. from Boston south, and much of China. "At no time will a precise time/location prediction from ESA be possible," the organization said. "Space junk this size falls to Earth a few times a year," NPR's Nell Greenfieldboyce reported, but "it's usually something like a spent rocket stage — not a home-away-from-home for space travelers."